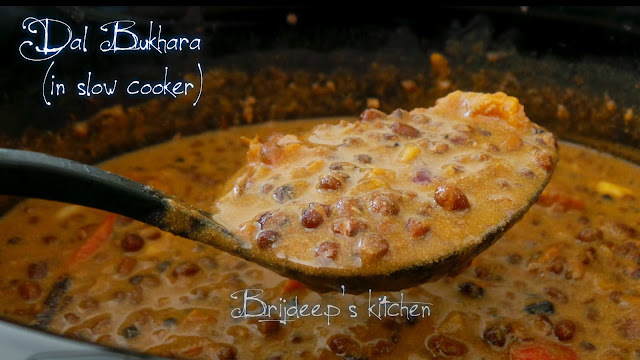 Dal Bukhara is a typical Punjabi dal which is made with the minimal spices and is a rich, creamy and royal dal. In looks it resembles to Dal Makhani, tastes completely different and the cooking method is also very different, and so are the ingredients. 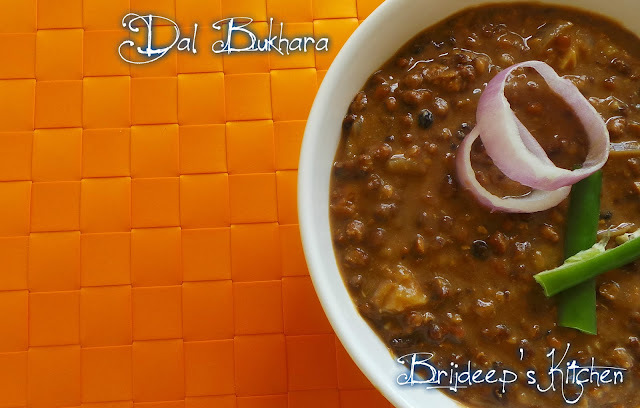 Some people confuse Dal Bukhara and Dal Makhani, some even think they are the same, but actually they are not. 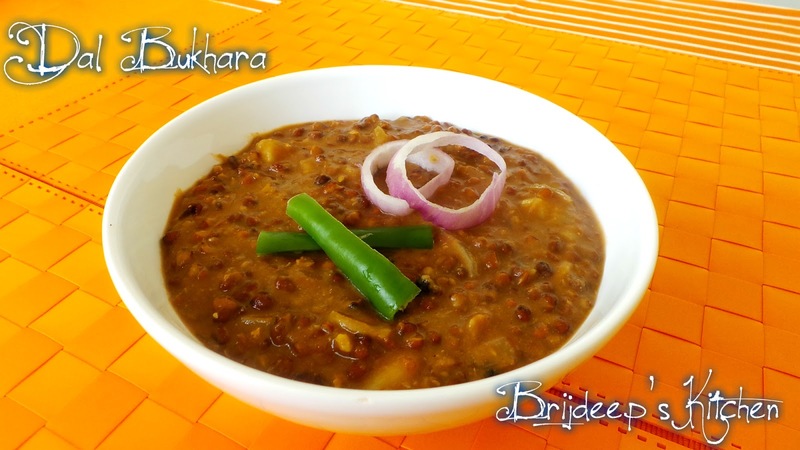 But a similarity is that both use Black Urad Dal as the base. 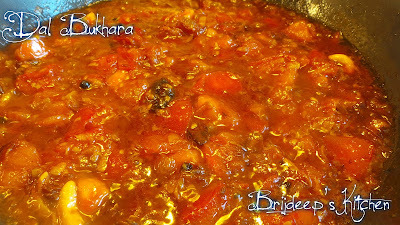 This authentic recipe was given to me by my Nani Ji who was born and brought up in Pakistan and later moved to India at the time of India-Pakistan partition. 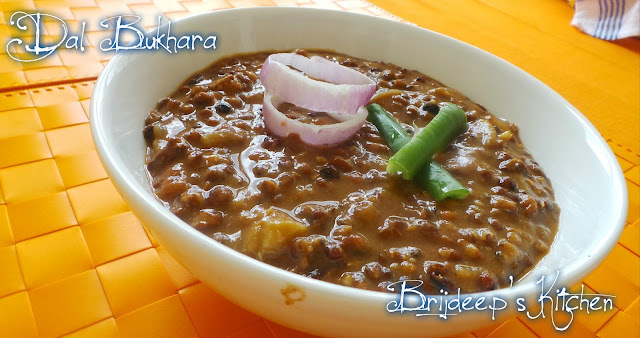 She told me about her childhood memories where she used to live nearby the area of Punjabi restaurants (which were more like dhabas) in Pakistan where this amazing dal was cooked overnight in slow flame in tandoors and the aroma of this mouth watering dal being cooked wafting in the air. They used to sometimes get this lip-smacking dal packed for home and used to make tandoori rotis to go with it to make a wholesome meal. Wash and soak both dals separately in water for 5-6 hours before cooking. Drain water and add both dals to a pressure cooker. Add 4 cups of water and pressure cook for 2 whistles. Turn off the flame and let the pressure release itself. 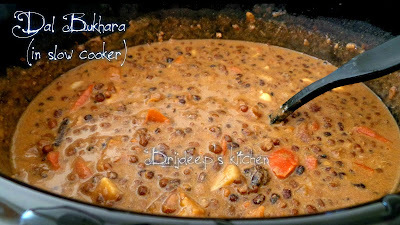 Open the pressure cooker and mix the dal. Add 1/4th cup milk and 1/4th cup buttermilk and mix well. Again close the cooker and keep on flame till 2 whistles. Again turn off the flame and let the pressure release. 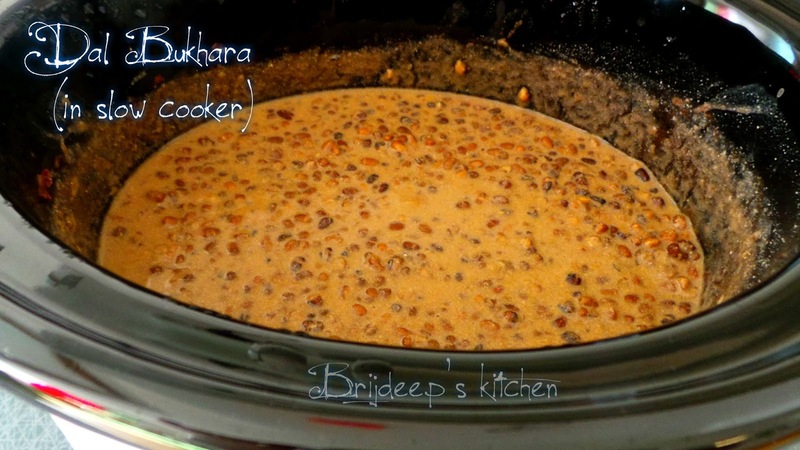 Open cooker and mix dal. Add in 1/4th cup buttermilk and mix in with the dal. Add 1/4th cup milk, mix well and again close the cooker till two whistles. This process will be repeated two more times, until we add and pressure cook all the buttermilk and milk. At this stage the dal will become soft and cooked. If not, do one more round with adding milk+buttermilk. Dry roast cumin seeds, cinnamon, black cardamom, cloves and peppercorns on medium flame. When roasted, add the mustard oil above the whole spices. It will start leaving a wonderful aroma mixed of mustard and the spices. Add the chopped onions and fry until they start getting brown. Add the ginger-garlic paste and mix well. Let cook for about 2 minutes. add in the cashews and fry well. Add the tomatoes and mix well. Add salt and let cook until the tomatoes are soft and mushy. Add red chilli powder and mix well. Add the tamarind and mix well. Cook for another minute. Add in the mashed and cooked dal. Mix well with the masala and cook for a minute. Transfer to the cooker and mix everything well. Add little water if required, ideally no extra water is added as this dal is thick in texture and consistency. Let cook for 20 minutes on low flame. If you have time then do leave on the lowest flame for about an hour (or as much time you have). Add garam masala and turn off the flame. Cover the cooker and let sit for 10 minutes. Remove cover and serve hot !!! 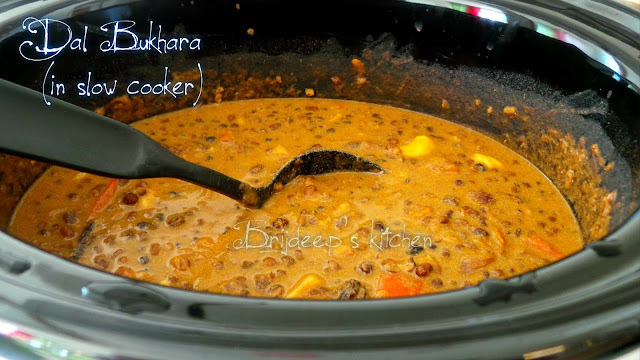 I have also prepared the Dal Bukhara in a slow cooker and it has turned out to be so much more creamy, rich, flavorful an yummy. 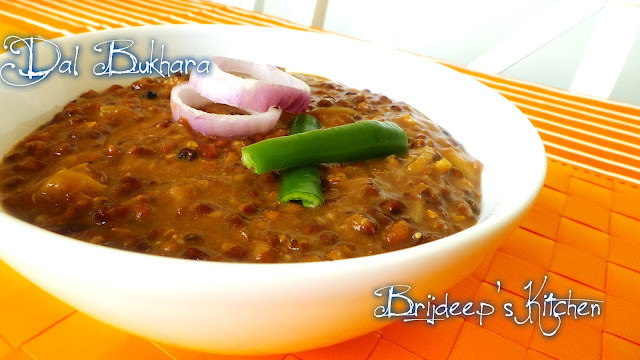 This dal basically used to be cooked on low flame overnight to bring out the best flavors. And my slow cooker has totally made it possible to have the creamy and slow cooked yummy flavor. Ingredients used in the preparation of Dal Bukhara in slow cooker are exactly the same as used in the normal procedure to be cooked on the stove top, as mentioned above. Wash and soak both dals separately in water for 5-6 hours before cooking. Drain water and add both dals to your slow cooker. Add 4 cups of water, mix and turn on the slow cooker and leave on low overnight or at least 8 hours. After 8 hours, the dals will be soft and cooked. Now add 1/4th cup milk and 1/4th cup buttermilk and mix well. Again close the cooker with the lid and leave on low for 2 hours. 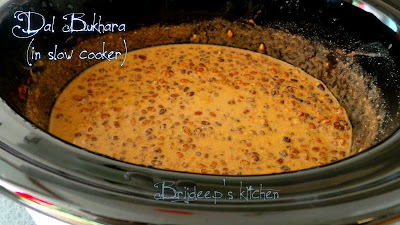 Open the slow cooker after 2 hours and mix dal. Add in 1/4th cup buttermilk and mix in with the dal. Add 1/4th cup milk, mix well and again close the cooker with the lid and leave on low for 2 more hours. This process will be repeated two more times, until we add all the buttermilk and milk. At this stage the dal will become soft and creamy. 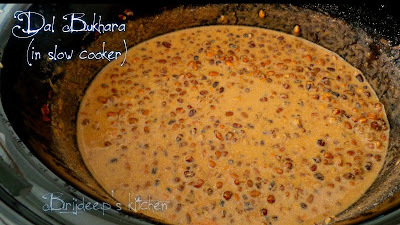 After you have added the buttermilk and milk for the last time, prepare the masala on stove top. It is the same way as we prepare on stove top method. Add the tomatoes and mix well. Add salt and let cook until the tomatoes are soft and mushy. Add red chilli powder and mix well. Add the tamarind and mix well. Cook for another minute. Turn off the flame. 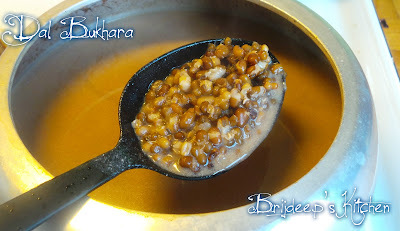 After 2 hours from the last time the dal has been put on low with milk and buttermilk are done, add this whole masala to the cooked and creamy dal. Mix well, cover with a lid and leave on low for another 4 hours. Remove cover, turn off the slow cooker and add garam masala. Mix well and serve the rich and wonderful slow-cooked dal with jeera rice! Loved this recipe? Please do leave a feedback and a comment in the comment section below. Want to get more yummy updates? Don't forget to connect with me on Facebook. Sounds delicious but is there a shortcut to preparing this lengthy process? Thank you for sharing! 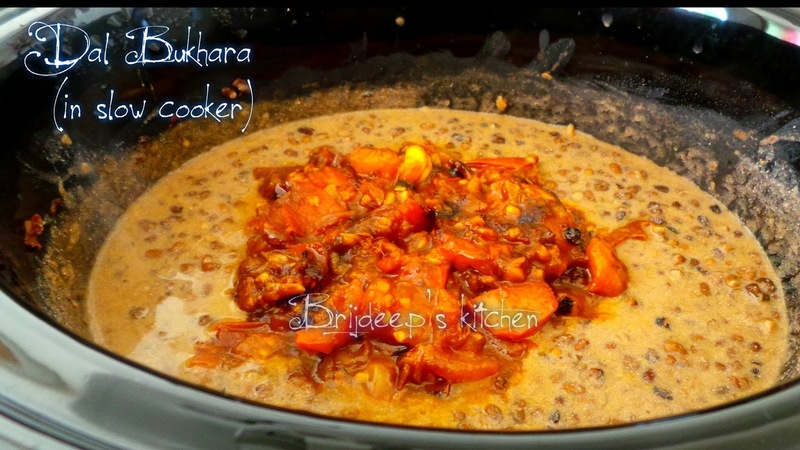 Hi.. no actually this is the short process of preparing Dal Bukhara.. the original method is to prepare it for about 6-8 hours in a traditional clay oven or tandoor.. hope you like it. that's how it is prepared to bring out the complete creamy flavor in the dal..
Hello .. What do you mean by 1 tspn tamarind ...pulp or water..is it optional? Loved your recipe. I will make in slow cooker overnight. Thanks for sharing your family recipe.